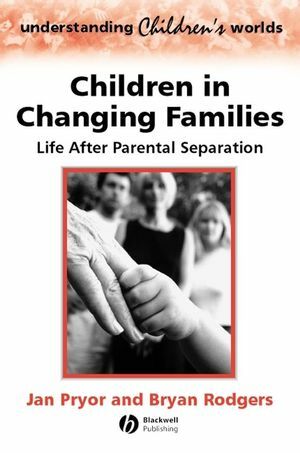 At time when separation and divorce are increasingly common, this book supplies much-needed insights into why some children survive change in families better than others. Jan Pryor is a Senior Lecturer in Psychology at Victoria University of Wellington in New Zealand. She is a Specialist Report Writer for the New Zealand Family Court, and an educator for lawyers and others working with families in the court system. Bryan Rodgers is a Senior Fellow in the Centre for Mental Health Research at the Australian National University. He has published research from the three large British birth cohort studies of children born in 1946, 1958 and 1970. In 1998 Jan Pryor and Bryan Rodgers authored a report for the Joseph Rowntree Foundation that reviewed UK research on outcomes for children whose parents separated or divorced. Glossary of Studies Frequently Referred to in the Book. 1. The Context of Family Transitions. 2. Frameworks for Understanding Family Transitions. 3. Family Transitions and Outcomes for Children. 4. Children's Perceptions of Families and Family Change. 6. Stepfamilies and Multiple Transitions. 8. Explaining Outcomes for Children and Young People. 9. Overview and Future Direction. "Pryor and Rodgers cover a broad overview of international demographic trends and a wide range of empirical research on the impact of changing family structures on children. Although not a "law book", it is very accessible; the empirical findings, where presented as tables, are clear and intelligible and where necessary are supported by explanatory text. They outline some of the major theoretical and conceptual frameworks currently used to discuss family change. These are applied later when the authors discuss the research evidence. In the final chapter the authors draw their conclusions for both policy and practice, highlighting where, in their opinion, further research is needed. The book keeps its well-organised structure of nine broadly headed chapters, each of which is further subdivided by clear subheadings. Covers research across North America, the UK, Australia and New Zealand. Examines different types of changes in families. Pays attention to children's own perceptions of family change. Provides research-based evidence to inform the debate over the role of fathers in children's lives.